What is Enteric Coated Omega-3? Enteric Coated Omega-3 is gently sourced from fish (anchovy, sardine, mackerel and/or salmon) from deep ocean waters. 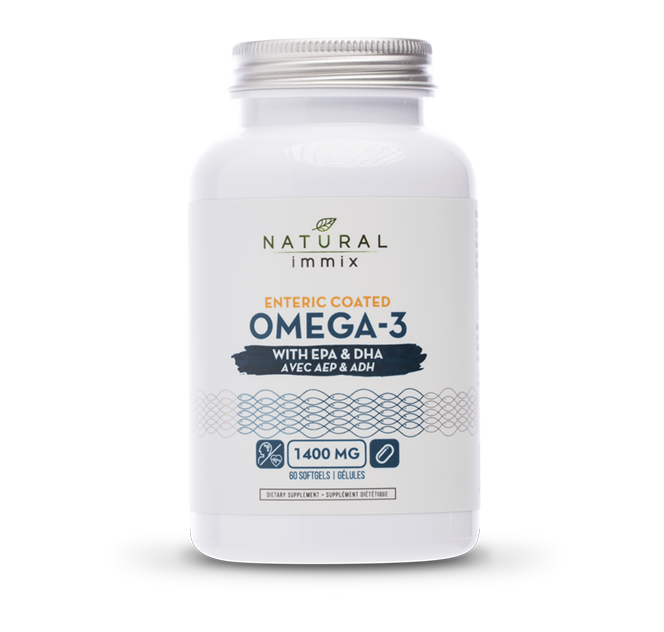 These fish oils contain long chain Omega-3 fatty acids, including Docosahexaenoic Acid (DHA) and Eiscosapentaenoic Acid (EPA), which play important roles in numerous metabolic functions. State-of-the-art molecular distillation is used to remove PCB's, dioxins and mercury in order to guarantee purity and potency. Omega-3's are essential to human health but cannot be manufactured by the body. They are instead found in foods like fish and in supplements such as Natural immix Enteric Coated Omega-3 softgel capsules, which provide all the benefits of food-based fish oils without the fishy aftertaste that you might experience without this special coating. Thousands of studies show the benefits of Omega-3 fatty acids for the heart and circulatory system however, many people do not get enough Omega-3 fatty acids in their diet. Two important Omega-3 fatty acids found liberally in anchovies, sardines, mackerel and salmon are Eicosapentanoic Acid (EPA) and Docosahexanoic Acid (DHA). Both of these fatty acids help reduce low density lipoproteins (LDL's) and raise levels of good high density lipoproteins (HDL's). These nutrients also reduce blood vessel constriction, lower fibrinogen (the blood clotting factor), and keep platelets from becoming too sticky. DHA (Docosahexanoic Acid): is another essential Omega-3 fatty acid found in cold water fatty fish such as anchovies, sardines, mackerel or salmon. Your body needs DHA for the proper functioning of your brain as an adult, and for the development of your nervous system and visual abilities during the first 6 months of life. In addition, Omega-3fatty acids are part of a healthy diet that helps lower risk of heart disease. Our bodies naturally produce small amounts of DHA, but we must get the full amounts we need from our diet or supplements. Enteric coating: Is a special barrier applied on dietary supplements that prevent its dissolution or disintegration in the gastric environment. The coating protects against the effects of stomach acids, which can interact with, destroy, or degrade nutrients thereby reducing the overall effectiveness of the supplement. Enteric coatings are selectively soluble. This means that they don't dissolve in the acidic environment of the stomach, but they will dissolve in the more alkaline environment of the small intestine. Enteric coatings are used in fish oil supplements to delay the point at which the fish oil is digested thus ensuring sensitive nutrients can be properly absorbed by your body, and also helping to prevent fishy aftertaste, which is the main reason why people stop taking Omega-3 supplements.